As usual, I woke up at 4 AM and was out of the house by 4:30. It was Martin Luther King Day, and seemed like a good day to go for a hike. Not much else was going on. There was a prediction of flurries for later in the afternoon, but there wasn't supposed to be much accumulation. I stopped first in Lincoln to find a place that rented snowshoes. I didn't think that I'd pass any rental places in Twin Mountain or Jefferson, but I had found several in Lincoln on the Internet. One place opened at 7:30, so that's where I ended up. They had a wide selection of sizes. 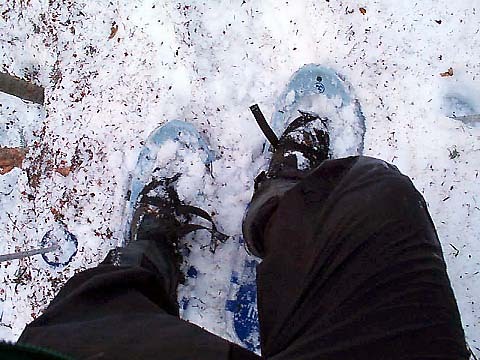 I decided to go with the 36" snowshoes; after renting some short ones last April to climb Mt Tom and postholing almost as much as if I had been bare-booting, I didn't want to take any chances. The trail turned out to be so well-packed though that these long snowshoes were overkill, and just added extra weight to my feet. I got to the trailhead about 8:15. The access road wasn't plowed all the way to the parking area, but there was space for one car at the dead end, so I parked there. The closest house was a summer residence anyway, so it was unlikely that I'd be in anyone's way. The Starr King Trail forms a small portion of the Cohos Trail, a 159-mile long trail system connecting the Presidential Range to the Canadian border at the tip of New Hampshire. 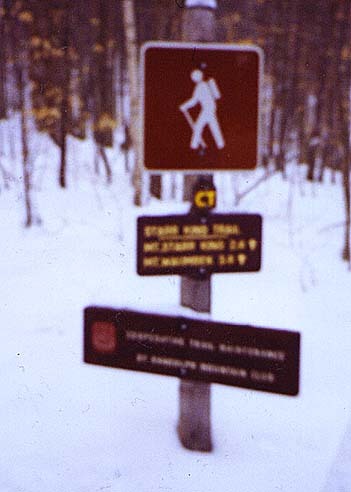 If you look closely at the somewhat fuzzy trailhead picture on the right, you'll see the Cohos Trail's yellow CT logo just below the hiker symbol. About a quarter mile up the trail, there's an old well next to the trail that must have served a farm at one time. It was full of junk when I looked in, so it didn't seem like a very good water source. Starr King Trailhead. 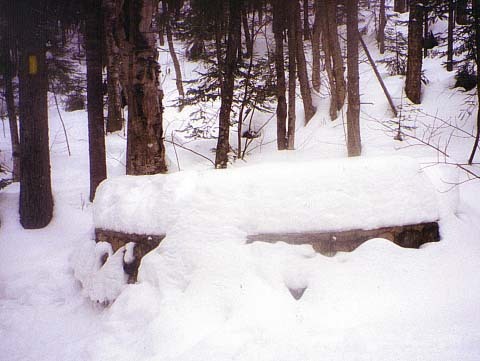 This trail is also part of the Cohos Trail, which reaches from the Presidential Range with the Canadian border. My snowshoes. Trying to compensate for the short ones I rented to climb Mt Tom last spring, I went too far the other way this time. These 36" snowshoes were overkill for the heavily packed trail. 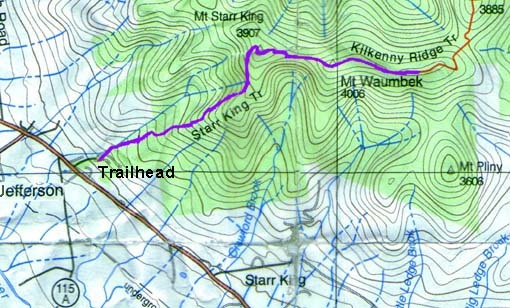 The Starr King Trail near the bottom. 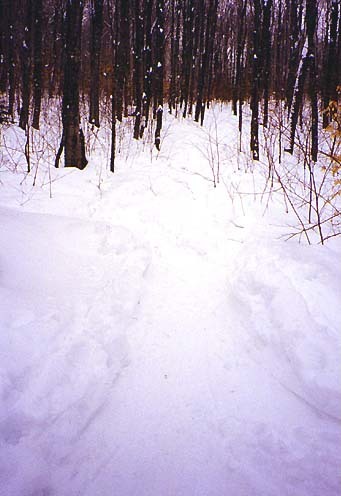 The trail was packed in a narrow strip along the center by previous snowshoers. An old well. Located about a quarter-mile up the trail, this well must have served a farm at one time.